On a recent visit to Cannes, I found myself in conversation with an Ed Psych. 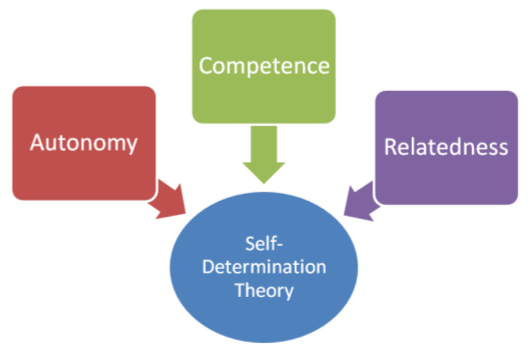 Naturally, conversation drifted from the weather and supercars to Self Determination Theory. My aim here was to strip a curriculum down to to its bare essentials, based on Self Determination Theory. 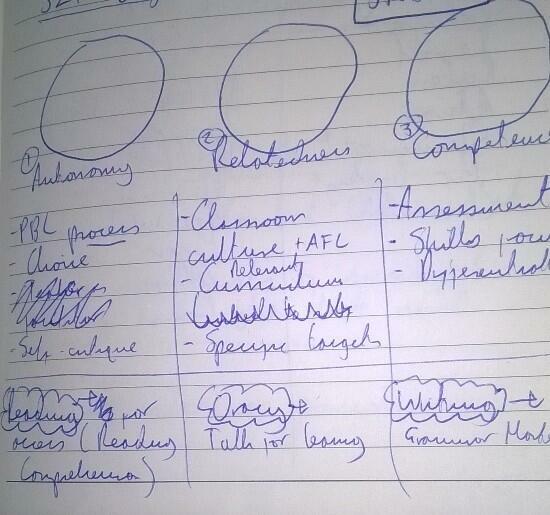 Autonomy – Students need an element of choice otherwise the learning experience is passive. The PBL process can be an effective context for skills to be applied, and constant reflection and self-critique will encourage a sense of ownership over learning. 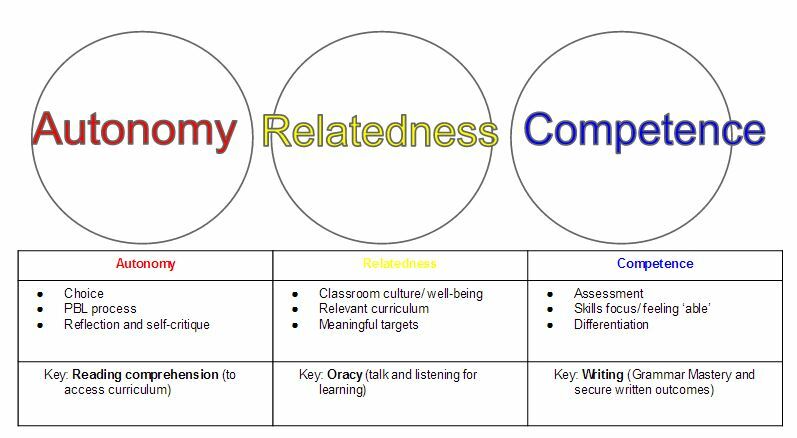 Relatedness – All of the best teachers I have worked with have developed a contract (often unspoken) with their students whereby expectations are clear and relationships are balanced. This relatedness to environment is crucial for learning to flourish. Competence – If you don’t feel able to do something, you won’t intrinsically want to do it. Curricula must offer a sense of competence to all students, and this is where thoughtful differentiation is important. 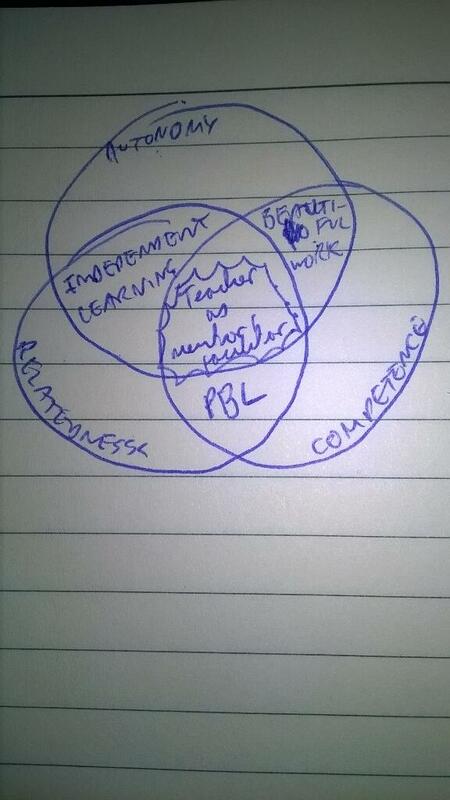 Next step :what is the role of the teacher in all of this? I have introduced this model to my department and it instantly focussed our conversations on curriculum design into something more essential than simply crowbarring skills into content. Furthermore, we could map the whole Key Stage 3 curriculum with a clear understanding of what we are trying to achieve, at a core level. How might you use this approach in your own curricula? Would be very interested to find out – drop me a comment. I am a big proponent of SDT. It has influenced my curriculum and methods through the years and forced me to look at things in a new way. I am probably the only teacher within a large radius of my classroom that does not assign homework (though students are free to work on things outside of school). While I have no firm deadlines (other than the end of the marking period, of course), I often ask students to mark down when they think they will be able to have it finished and turned in. This gives them the opportunity to become better time managers. Also, how can they fuss at me about deadlines when they set it for themselves? My role as teacher has come to not fit neatly into “sage on the sage” or “guide on the side”. I find myself to be more of a “clown all around” who serves a variety of roles. I introduce projects and set success criteria in strands. As many strands as the student is able/willing to finish corresponds to their final score. No games, no surprises – they must choose. I do a lot of on-the-spot mini-lessons with individuals and small groups. I continually assess formally and informally to help choose our next steps. And to answer the question I know you’re asking: Yes, it works. Student engagement is better, the quality and quantity of work I get is better, and, yes, the test scores are also higher. The purpose of it all is to develop and empower independent learners who are persistent and who self-regulate. Too many people stress about not creating winners when we should be setting the stage for winners to create themselves.